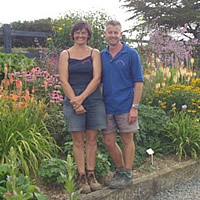 Owners Nick and Sheila have always worked in horticulture, building up a wealth of experience from working on their own gardens and allotments as well as within the industry. Nick studied at Wye College, part of the London University, for a BSc degree in Horticulture. He worked briefly at Blackmoor Fruit Nursery and Hilliers, before 11 years at Notcutts, leaving to move to Cornwall and set up the nursery. Sheila is from Cornwall and worked at two local nurseries for work experience before studying for a National Diploma in nursery stock production, at Pershore College in Worcestershire. She has worked at Wyevale Nursery in Hereford, Hilliers and Notcutts Garden Centres. 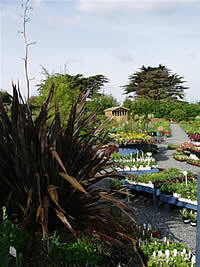 Sheila worked at Notcutts Garden Centres as a Planteria Manager, before leaving to set up the nursery with Nick.